If prison escape films have taught us anything, it's that there's no shortcut to flying the coop for any jailbird. 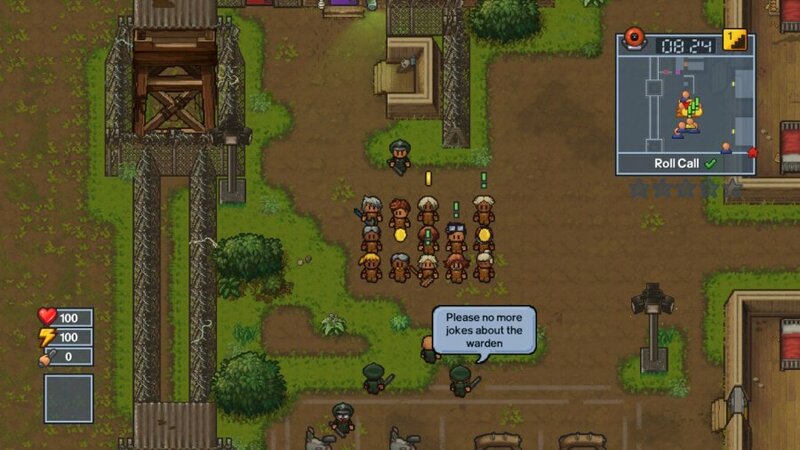 It's a drawn-out struggle that the The Escapists 2 captures brilliantly. From The Great Escape to The Shawshank Redemption via Escape from Alcatraz, we've learned that even the most brilliant jailbreak requires considerable time, planning, ingenuity and luck. You'll need all of those things to bust out in Team 17's new Switch game. 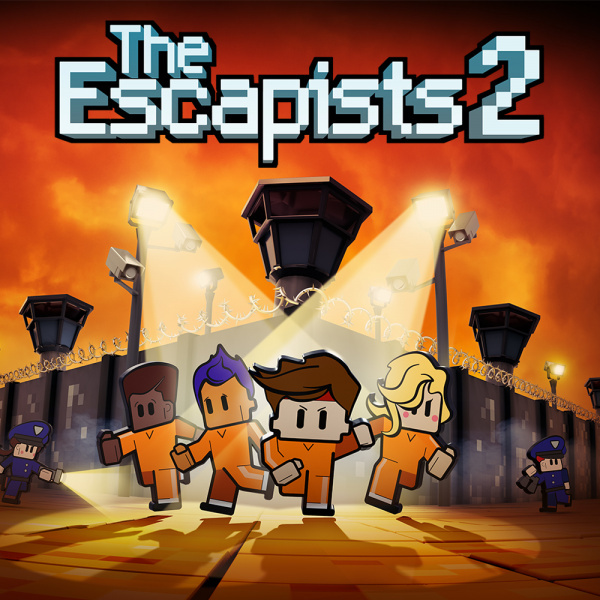 Each prison in The Escapists 2 is a tiny clockwork sandbox, with dozens of AI-driven characters going about their business. The key difference between this and your average open world game - beyond the obvious scale - is that you're expected to follow as rigid a schedule as your fellow inmates. First there's morning role-call, then breakfast. You'll need to exercise, shower, eat lunch, work a job, eat dinner and attend a final role call before bed time. All of which might make you wonder when you're supposed to go about the business of breaking out. 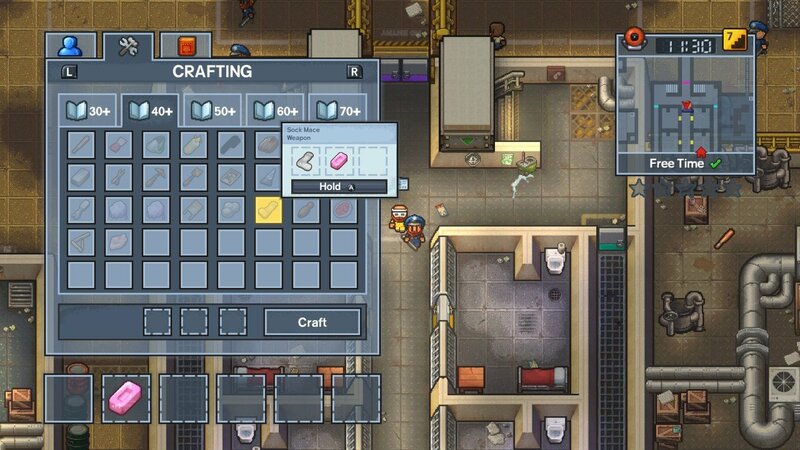 The true skill in The Escapists 2 is in playing the system. There are little pockets of opportunity to be discovered and exploited outside of your two allotted segments of Free Time. It's not explicitly stated, but you don't actually have to be at your next appointment dead on time. So, for example, you might use the morning role call to sneak into your neighbour's empty cell and steel a bar of soap from their desk. You'll also figure out that once you've clocked in to one of your appointments by entering the area, you're free to wander off and do something else. And there's so much 'something else' to be getting on with here. Maybe you've spotted an outside wall in the library that can be broken through, giving you a free run at the external fencing. You'll need to assemble the components to craft a pickaxe, some wire-cutters, and a poster to cover your wall work. That sounds simple, but remember what we said at the outset. Assembling those components will either require you to sneak around and steal them from your fellow prisoners, or to buy them from those same inmates. You'll probably find that you need to do a bit of both. In order to buy items you'll need to run errands to earn money. This is essentially The Escapist 2's mission system, as you tick off odd-jobs like planting incriminating evidence in a cell, stealing items on demand, or roughing up an inmate who's getting too big for their boots. So you have your components. Are you smart enough to craft all of the gear you need? If not, you'll need to find time to hit a library and up your intellect level, which is achieved through a simple mini-game. Similarly, you can get physically stronger and faster by working out in the gym. There are multiple alternative escape methods to be discovered too. You could dig a hole, forge a bunch of keys and steal a guard's uniform, pose as a member of a documentary crew and much more. All require a number of stages to execute, and there are also location-specific options depending on which of the ten prisons you choose. It all builds up to a truly heart-pounding escape day (or night), as your prolonged efforts - and the fact that all your work will be undone if you fail - lend that final push for freedom extra significance. All of which might make The Escapists 2 sound like it's heavy-going, but it really isn't. In fact, the game is full of charm and humour, with an expressive retro art style and an endless stream of light-hearted speech bubbles emanating from the guards and inmates. This light tone, combined with a series of jolly background ditties, serves to make your extended efforts a lot more bearable and even pleasant. That said, there's no escaping the fact that The Escapists 2 can be hard work at times. It's just got so many layers of systems, some of which are clumsy or poorly explained, that breaking free of them can feel like a miraculous jailbreak in itself. This mixture of lighthearted fun and flawed chaos is evident in the game's local splitscreen multiplayer mode, too. It's undeniably great fun orchestrating a jail break with friends, but the game gets a whole lot fiddlier with less screen real estate. Online with friends is arguably the ideal way to play, but you'll want to set up some kind of third party voice chat system to get the most out of it. Inviting strangers into your prison, meanwhile, is a surefire recipe for your careful plan getting spoiled, but if you fancy a quick riot it can be quite cathartic. The Escapists 2 is an ingenious, multi-layered clockwork sandbox that offers you a wide range of routes to freedom. Its tough demands and myriad competing systems can lead to frustration, but a winning sense of humour and knock-about fun always brings you back for another jailbreak attempt. I love this game on PC so I'll double dip ! Good timing as I'd just posted the launch trailer. 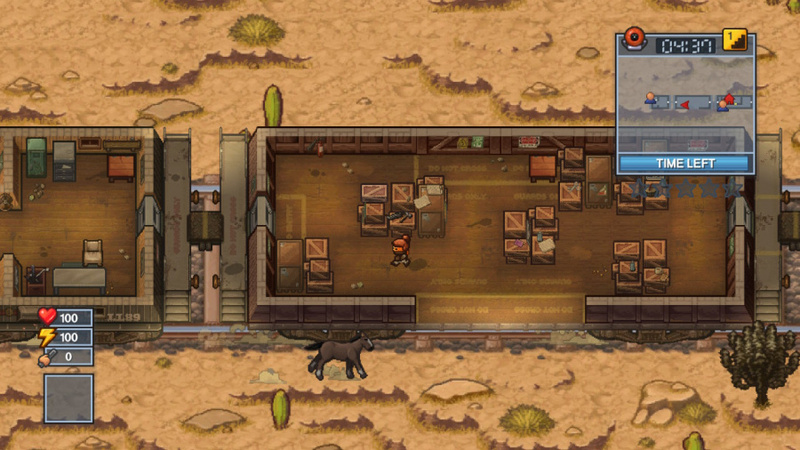 Following a successful launch of The Escapists in 2015, the series has since gone on to celebrate over 4 million downloads. 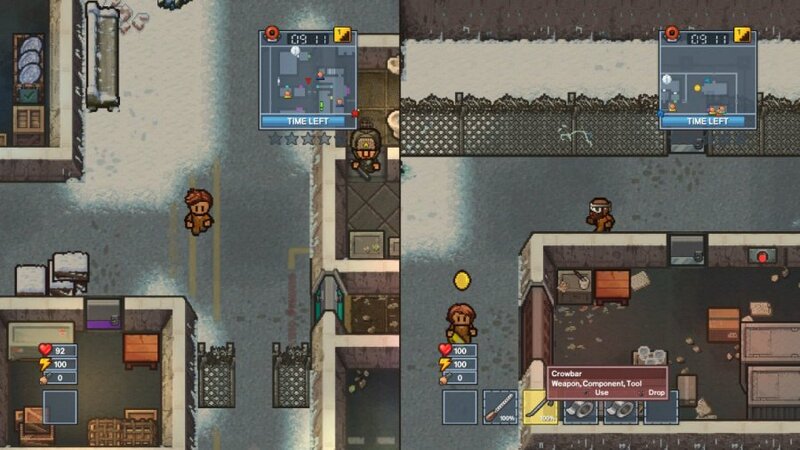 Now the sandbox pixelated prison-escape game is back and better than ever with improved graphics, crafting and combat and the addition of multiplayer, the most fan requested feature to date. So, don your orange overalls and begin planning your escape route because it’s time to return to prison! *Drop-in, drop-out online multiplayer experience. Carefully plan and execute an intricate escape from your initial incarceration with your fellow inmates either online or locally, or simply hop into an existing game already in progress to help pull off the final touches of the escape! *New items to craft - Build yourself a homemade Taser to knock out guards plus many more! Very tempted. Am I wrong in thinking this has a bit of a Skool Daze vibe? I've been loving this the past week! Never touched it on PC, but darn if it hasn't hooked me on Switch. Looking forward to playing this tonight. Never played a prison escape game before. You don't really say much about the online modes. I know there is a Vs mode, how does that play out? Seems like it could be a more fun way to play multiplayer than online co-op. It's "roll-call" by the way. I've had my eye on this for a while, I'll have to pick it up after I finish Cherry Blossom. Wasn't so sure about this but sounds like I might need to get it. I've been looking forward to this one for awhile! Team17? Yes please. Everything they have brought to the switch thus far has been fantastic. Playing this game makes me look forward to breaking out of prison one day IRL.